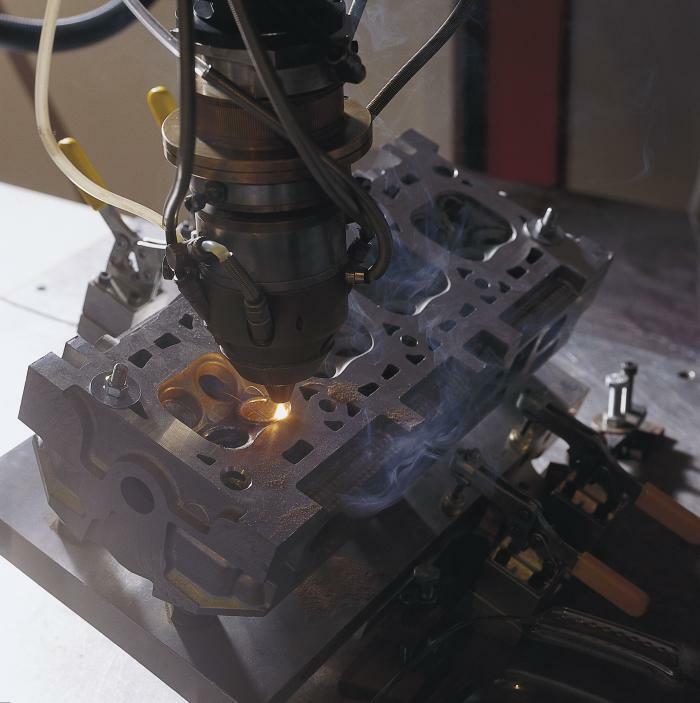 Laser cladding is a technique for depositing metallic material on the surface of a complex-shaped part in order to give it a new surface function, for example in order to prevent the wear and tear of mechanical parts. It makes it possible to repair worn surfaces. Laser cladding is a technology that consists in melting filler material in the form of powder, injected through a coaxial or lateral nozzle, in order to deposit metallic materials in the form of fine layers on the surface of a substrate. If it is different from the substrate, the new material gives the surface new properties. That is known as surface functionalisation by laser cladding. If it is identical, the cladding process makes it possible to repair worn parts or parts with machining defects (recovery of off-sized functional parts). In order to prevent wear and tear in mechanical parts subject to high strain or to correct defects, the laser cladding process makes it possible to repair or functionalise targeted areas of functional mechanical parts. If the filler material is in the form of powder, that requires the use of coaxial or lateral nozzles. 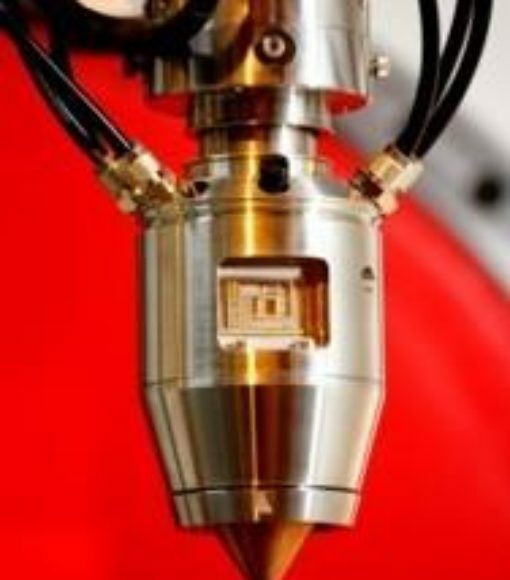 Consequently, laser cladding allows localised surface functionalisation by depositing fine metallic layers with low dilution and dense deposition. Like metallisation processes, it allows the localised depositing of the most precious, strongest and most resistant materials. This type of treatment is effective, economical and saves on raw material. The technique is also used to reinforce parts by adding new materials as required, delivered in the form of metallic powders and fused by laser (iron base, nickel base, cobalt base, aluminium, molybdenum base, copper base etc.). This process is part of the selective laser metallising process family. The technique is accurate and flexible. It allows the possibility of adjusting the chemical composition of metal alloys to meet requirements, and depositing them in targeted areas. The technique may sometimes be implemented on parts with surface heat treatment. Thus, it makes it possible to extend the life of used, damaged or defective parts, or limit possible surface attacks. Cladding is used in different areas of industry: automotive (valves, cylinder heads, anti-corrosion coating), defence (arms), energy (drilling tools, turbine blades), aviation (dynamic seals, MRO), medical engineering (prostheses, implants). Localised improvement of the mechanical characteristics of the Z profiles of blades. Because the thermal energy of the laser is controlled, the integrity of the substrate is protected. 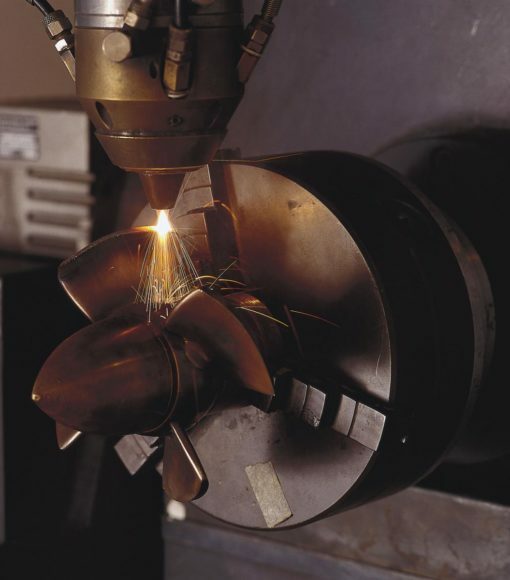 Laser cladding and repair processes have grown considerably in recent years. IREPA LASER has set up a department specialised in laser cladding, leading to several patents and innovations.